Fred Waldhauer, Proportional Control System, 1966. Fred Waldhauer operates the Proportional Control System with two electronic pens for David Tudor's performance, Bandoneon! (a combine) at 9 Evenings: Theatre and Engineering. [Plotting Board of the Proportional Control System / designed and constructed by Fred Waldhauer] (1966, 1 item: oscillators, resistors and an amplifier in a metal and plastic container; 26 X 36 X 8.5 cm + light pen). Components used to remote control sound sources during David Tudor’s performance Bandoneon! (a combine) and Deborah Hay’s performance Solo presented in the context of "9 Evenings: Theatre and Engineering" held at the Armory (New York, N.Y., USA) in 1966. The light pen was added in the 1990’s as a demonstration item. The Daniel Langlois Foundation for Art, Science, and Technology, 9 Evenings: Theatre and Engineering fonds. Various electronic components prepared during rehearsal week in the Berkeley gymnasium, Berkeley Heights (New Jersey, United States). In the middle distance is the Proportional Control System command box. The Proportional Control System command box created by Fred Waldhauer and the Switching Matrix by Robert Kieronski. Performance presented as part of 9 Evenings: Theatre and Engineering, The 69th Regiment Armory, New York, N.Y., United States, October 14-18, 1966. Fred Waldhauer, Proportional Control System, 1996. Dimensions: 10" x 14" x 3"
In 1966, Fred Waldhauer was working as a communication systems engineer at Bell Labs. Some of his friends were musicians, and he would occasionally collaborate on their projects. Waldhauer developed the Proportional Control System for the 9 Evenings festival. 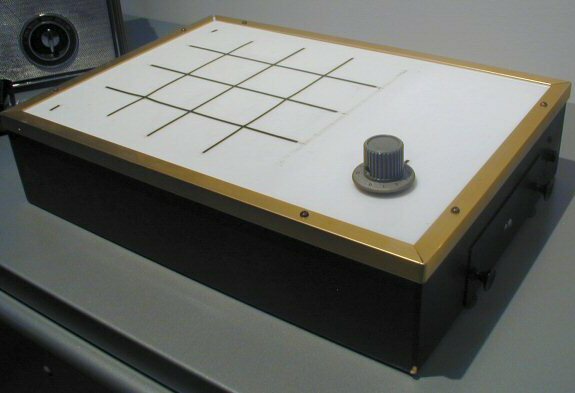 The main role of this instrument was to act as an easy-to-use interface: an electronic pen was guided along a table top to remotely control up to 16 objects that operated via an electronic signal (speakers, projectors, motors, etc.). 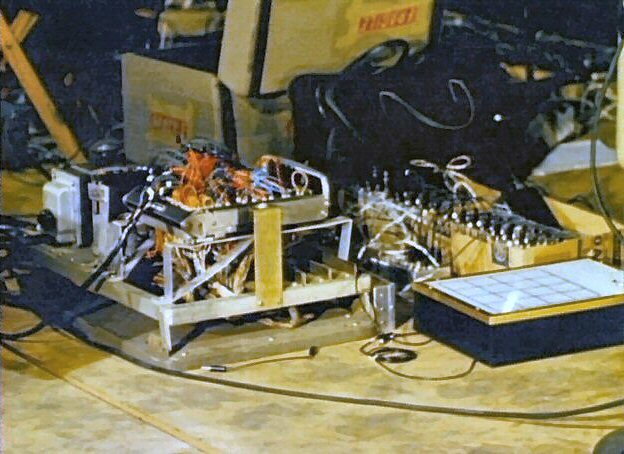 This was neither an audio nor light console, but rather a multi-purpose instrument that could be directly controlled by the artist. In 9 Evenings, three performances used the Proportional Control System: Bandoneon! (a combine) by David Tudor, Solo by Deborah Hay and Variations VII by John age. It was essentially used to spatialize sound: 12 zones were allocated to 12 speakers distributed around the performance area. 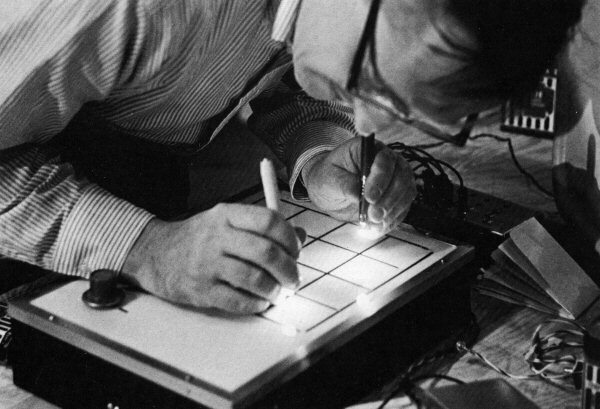 Operated by David Tudor in Solo, sometimes using two electronic pens simultaneously, in Bandoneon!, the Proportional Control System allowed the luminous intensity of certain projectors, volume and sound spatialization to be controlled. In this performance, the input was not the pen, but rather the sound signal emanating from the bandoneon and captured by four microphones. Fred Waldhauer felt that the Proportional Control System was under-utilized during 9 Evenings. It was in fact only used from time to time, while it could have been one of the key components of TEEM and replaced some of the more traditional elements, such as the Speaker Distribution Matrix. After the festival, the Proportional Control System was one of the components offered to artists by Experiments in Art and Technology (E.A.T.). Waldhauer built a new version of the interface for a performance by John Giorno in the late 1960s. The Proportional Control System consisted of a plotting board, 16 receivers and an electronic pen. The top of the board was covered with a sheet of white plastic, on which a grid was drawn with 16 zones. Electronic components (oscillators and amplifiers) were installed inside the board. The 16 receivers were composed of a filter, sensor and controller. Two electronic component modules and an electronic pen. Oscillators, photoconductive cell, amplifier, filters, sensors, controllers, transistors. The Proportional Control System was an intuitive interface designed for artists, which allowed visual and/or audio performance elements to be remotely controlled. The amount of light captured by the photoconductive cells under each of grid zones varied proportionally with the distance between the electronic pen and the grid. This variable signal was transmitted to 16 receivers via a composite output. Each receiver could be linked to a projector, speaker or motor. It was therefore possible to spatialize the sound by linking each grid zone to a speaker and simultaneously adjusting the volume of each speaker according to the distance between the pen and the grid. In addition, a sequence of events triggered by the movement of the electronic pen (or any other type of input) could be tape recorded. It was then possible to program the Proportional Control System by using this tape as an input. Remote control of projectors, speakers and/or electric motors. Norma Loewen, Experiments in Art and Technology: A Descriptive History of the Organization (New York: New York University, 1975) 420 p.; Ph. D. dissertation delivered at the School of Education, Health, Nursing and Arts Professions, New York University, 1975. [Memorandum - Abstract on Proportional Control System for the Festival of Art and Engineering. And notes about its use / Fred Waldhauer] (Dated September 19, 1966), 1 sheet. The Daniel Langlois Foundation for Art, Science, and Technology, 9 Evenings: Theatre and Engineering fonds. — 9 EVE 00032686. [Interviews Made While Producing the Documentaries on 9 Evenings: Theatre and Engineering] / [produced by Experiments in Art and Technology; interviewers : Barbro Schultz Lundestam, Julie Martin, Billy Klüver] (Shot the 7 and 8 of September, 1997), 1 videocassette (2 hr. 4 min.) : master, col., stereo, DVCAM (Sony). Interview with John Giorno, cameraperson in Open Score by Robert Rauschenberg. The Daniel Langlois Foundation for Art, Science, and Technology. 9 Evenings: Theatre and Engineering fonds. — 9 EVE VID 00032224 / M.
For 9 Evenings, Fred Waldhauer created the P.C.S. used by David Tudor in Bandoneon! (a combine). Fred Waldhauer earned an engineering degree from Cornell University (N.Y.) and a master's degree from Columbia (N.Y.).